Bill Danby: "In No Great Hurry"
In No Great Hurry - 13 Lessons in Life with Saul Leiter TRAILER from Tomas Leach on Vimeo. Since the movie, Saul Leiter passed away (in November of last year). Leiter did fashion photography to pay the bills; but, in addition, he took the time to take photographs of his own. We're the beneficiaries of that lifelong effort. Leiter was one of those who worked in colour, back when black and white still ruled the art world. His book, "Early Color" is outstanding. It shows how the everyday world can afford endless opportunities for art. If the photo below has a painterly look, that may be because of Saul also being a painter. 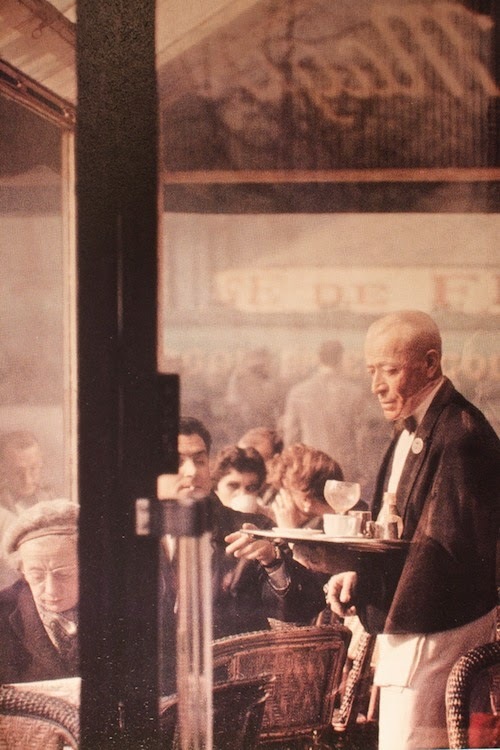 Saul Leiter's "Waiter" Paris 1959, from "Early Color"
So, how is that a photographer who inhabits the Mt Olympus of street photography went relatively unrecognised for so many years? ...Leiter didn’t court fame, and though he continued to work, his photographs almost vanished from public view. Then they came back to light in 2006, with “Saul Leiter: Early Color,” a monograph published by Steidl. The book brought him belated recognition, gallery representation, a stream of publications, and a new generation of fans. As of last month, they [Margit Erb, his gallery representative, and Anders Goldfarb, his long-time assistant] had catalogued three thousand books, two hundred and fifty thousand negatives and slides, and a host of priceless ephemera, including Leiter’s correspondence with Diane Arbus, Henri Cartier-Bresson, and Irving Penn, whose praise for “Early Color” particularly pleased Leiter. They also found a cube-shaped suitcase from the nineteen-forties filled with undeveloped slide film. Saul Leiter is gone, but his work is still with us. Happily, it's not too late to become a Leiter fan.